Usually, cabin pressure of an airliner is kept at a value corresponding to an altitude of not more than about 2000m. I was in a 737-800 flying at 11500m. While the aircraft sank on approach for landing, I felt that typical pressure on my ears several times though we still were above 7000m. So, the cabin pressure already changed at that high altitude. So, how is cabin pressure related to outside pressure during the entire flight? Here is a plot of cabin pressure on one flight. You can see a small increase in pressure right before takeoff. The decrease and increase in pressure is fairly constant during climb and descent. The pressure will change based on the aircraft's altitude, and will not reach a minimum limit until closer to the aircraft's service ceiling. This keeps pressure changes as slow as possible while giving a lower cabin altitude when below the service ceiling. On a number of aircraft types the cabin pressure is increased during the take-off roll, ensuring there is a slight over pressure when the aircraft rotates. This prevents some sudden changes in cabin pressure during rotation when the cabin exhaust valve is exposed to changing airflows. 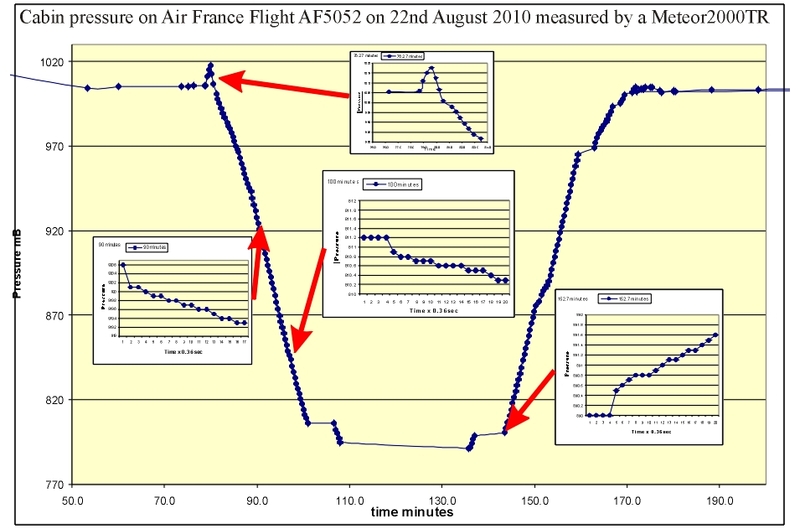 The chart in @fooot's post clearly shows the initial increase in pressure during take-off. During the climb the cabin pressure is slowly decreased. While a typical passenger jet may climb at speeds in excess of 2000 feet per minute, the cabin pressure will decrease at an equivalent rate of climb rarely exceeding 500 feet per minute. When the cabin pressure has dropped to an equivalent of about 7000 ft altitude (the aircraft will be much higher by that time) the cabin pressure is kept constant. When the aircraft starts to descent on approach to the airport, the cabin pressure is slowly increased at about a rate of 300 feet per minute. By the time the aircraft has reached the airport level, the cabin pressure should have reached ambient pressure. To achieve this, pilots have to set the cabin altitude for landing, otherwise the pressure will not equalize. To the best of my knowledge, cabins are never pressurized before takeoff. This is a safety issue as it would inhibit door opening. The pressure would make them impossible to open. At a constant pressure difference, i.e. the cabin altitude increases evenly up to cruise altitude. This would indeed mean that the moment it takes off it starts to build up a pressure in relation to takeoff. This means that the pressure difference is perceived as gradual. At a fixed minimum pressure, i.e. the valve just closes at (for instance) 2000m and then maintains 2000m altitude all the way up, just building an increasing pressure differential. Both methods have to take into account the landing altitude, since you don't want to land the aircraft pressurized. The former is more common since it's nicer. This would also explain why you perceived a change even at high altitude. During descent, why do my ears hurt, but only sometimes? What's the cabin pressure of a Bombardier CRJ-900?